SAE CLAMMY, CAULD AND THICK. WHO COULDNAE AGREE AT A’. BY GOD, THEY SERVED YE ILL. 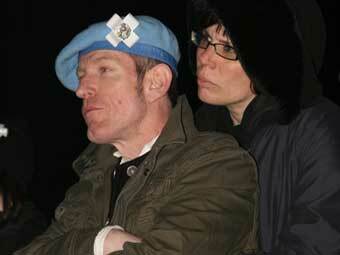 THE LIKES O’ ME AND YOU. 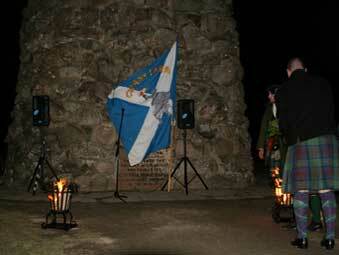 Once again we mustered at the Smithton Hotel, our base for the annual midnight service at Culloden. A warm welcome from the manager and staff ensured us we’d enjoy our stay once more. 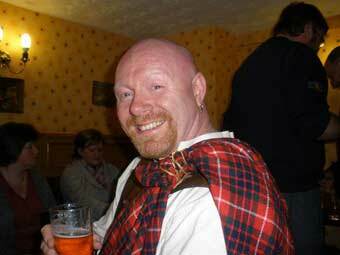 We all gathered in the bar for a few refreshments and some banter before making our way to the battlefield in the dark whereupon arrival we found a serious lack of torches!! As we made preparations for the commemoration we started to notice lights in the distance on the moor that told us this event was going to be well attended once more. 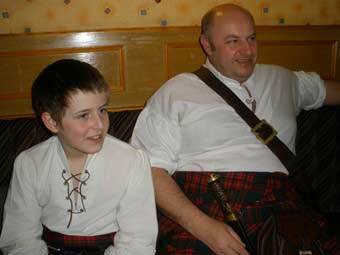 Jim & The Mini Laird. Heating myself up as best I can!! 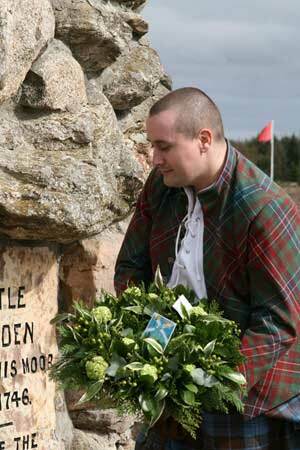 Alec lays the Cran Tarra wreath. 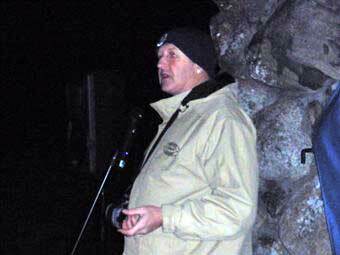 Once again Jim Singer took the microphone and said a few words about what being there meant to him personally, he echoed the sentiments of many of as he did so. Jim then invited anyone to come up and say a few words. It’s always a nice part of the evening when folk get a chance to come up and say what they feel, not everyone is comfy speaking in public, but the ones that do speak from the heart. First up was writer and historian David R. Ross who despite ill health had managed to make it and we were all delighted that he did so, always great to hear David speak. 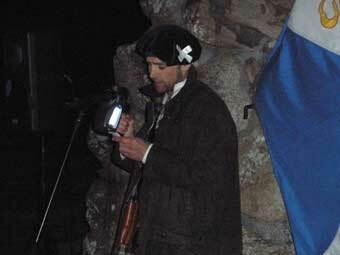 The midnight service had a lot of new faces and quite a few of them got up to say a few words who had obviously never done such a thing before, but they got a chance to say how they felt about their country and how much their visit to Culloden had affected them, Culloden has a way of doing that to a lot of people. 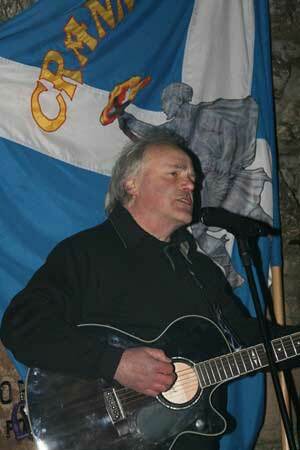 We also had a wee bonus of a song sang in Gaelic by one of the congregation, young Àdhamh MacLeòid, not many of us understood the words but it suited the moment beautifully. We then had the laying of the Crann Tara wreath performed this year by Crann Tara member Alec Mowatt, whereupon anyone with flowers was invited to do likewise. Jim doing a great job as host. David says a few words. 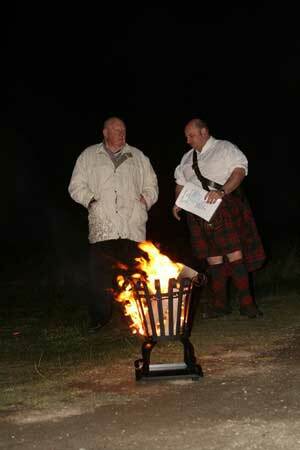 Jim & Big Brian getting a heat!! 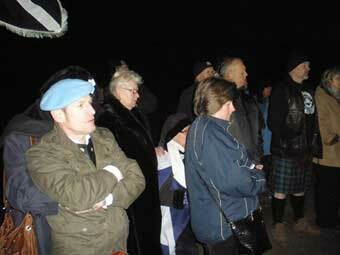 A cold night but a healthy crowd was there. John reads us a poem. Next up was the incomparable Ted Christopher!! Ted had come all the way from Stirling to sing a song for us and then immediately drive all the way home after the service! Sums Ted up perfectly, if there’s a better Patriot out there I’ve yet to meet him, thanks Ted. 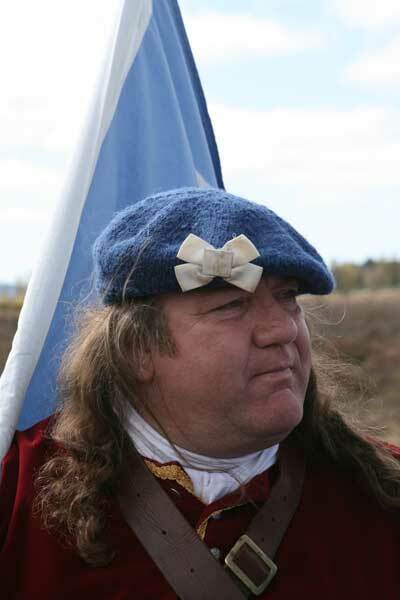 There was only one song that Ted could sing at Culloden and that was the wonderful “Freedoms Flame” which Ted sang beautifully well despite the smoke from our burners wafting into his face, Ted you’re a legend Sir. Jim Singer then invited us to take part in a minute’s silence which was observed with the upmost dignity and left everyone with their own thoughts on this most grim piece of land. 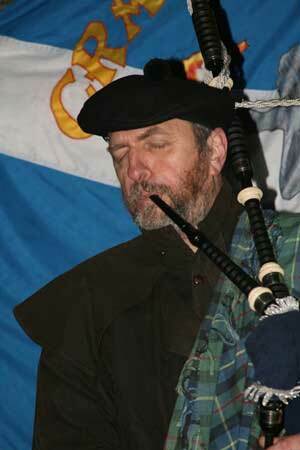 Duncan Browne brought proceedings to an end with a Piper’s Lament, (told you he was a man of many talents!!) 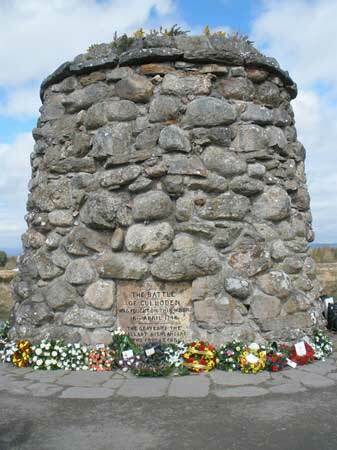 Hearing the pipes on Culloden Battlefield at one in the morning is an experience everyone should have at least once in their lives, very atmospheric indeed. I hope the heroes lying beneath our feet may have heard them on this night and realise that they are not forgotten and will live on forever in our hearts and minds. 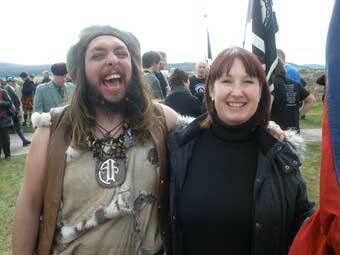 Alba Gu Brath!! We were all up bright and early to have a hearty breakfast (some of us had two!!!) 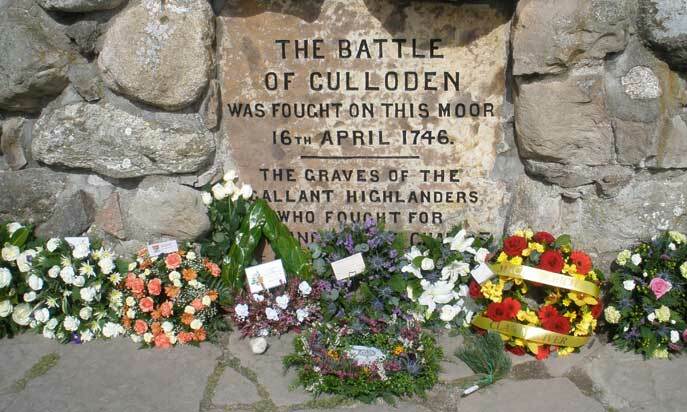 before we set off for the Gaelic Service on the Culloden Battlefield We arrived nice and early and I have to admit it looked as if there was going to be a poor turnout, with about fifteen minutes to go it wasn’t looking good! Then from all corners of the moor folk started to arrive in their droves, some dressed in period costume others with their finest attire. 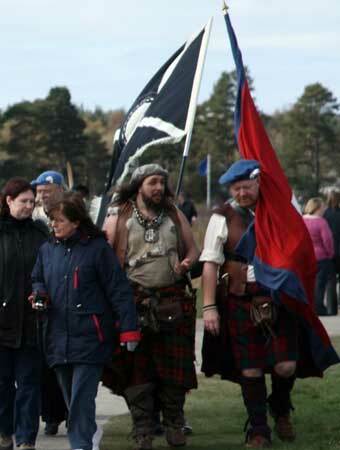 This is always a colourful although sombre event but some of the Jacobites standing with us could have easily risen from the earth this very day such was their appearance, very spooky to say the least. 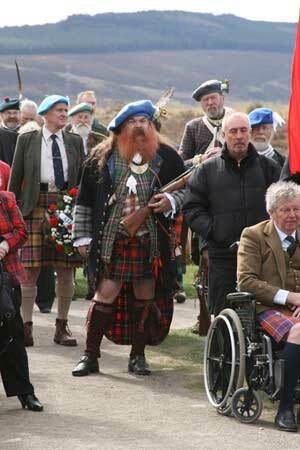 We were welcomed to the service which is held every year by the Gaelic Society of Inverness. Their representative proceeded to speak to us first in Gaelic, then in English, always nice to hear the Gaelic at this worthy commemoration. 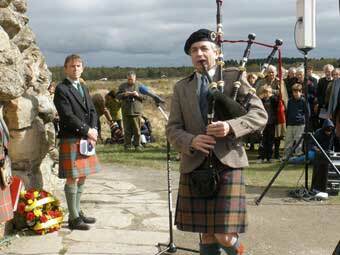 We then had the Reverend Kenneth D. MacLeod performing the service in both languages once again to a hushed audience. 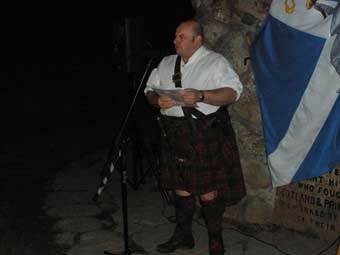 Next up was writer Kellan MacLean to tell us a few stories of the Battle of Culloden and specifically some of the people and clans involved, always good to hear wee stories you’ve not heard before!! 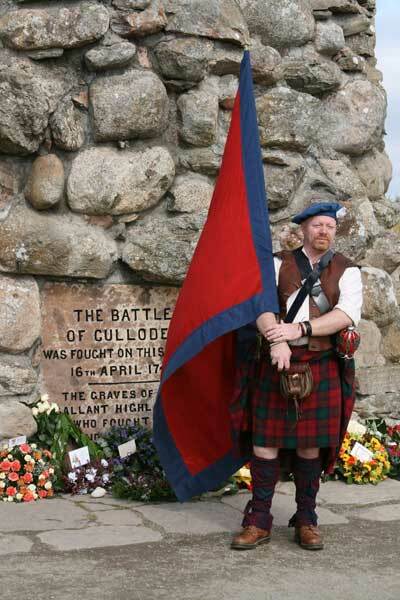 We then had a lament played on the Great Highland Bagpipes by Dr Angus MacDonald from Glenuig in Moidart, and what a fine player he is too, he walked round to the back of the monument still playing as he walked farther away with the tune fading delicately away, a lovely wee touch indeed!! The assembled crowd were then invited to lay their wreaths and flowers in an orderly and dignified manner befitting of the day and Alec Mowatt had the honour of laying the Crann Tara wreath this year and a splendid job he did as well, well done Sir!! The Cairn & all the tributes! !